Dr. Daniel Rubens of Seattle Children’s hospital, who believes inner-ear troubles might provide a clue to the mystery of Sudden Infant Death Syndrome, has teamed with researchers in the U.K. With new funding, the team will launch a two-year study in May. The heartbreak of Sudden Infant Death Syndrome (SIDS) is being turned into hope, as parents who have lost babies to the medical mystery are helping to fund a new research study to be launched by a Seattle doctor who hopes he is close to a cure. 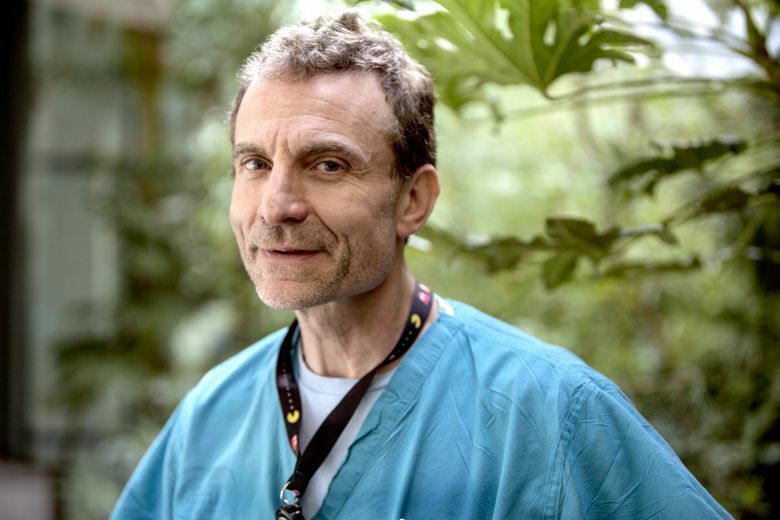 Dr. Daniel Rubens, an anesthesiologist at Seattle Children’s hospital, has partnered with The Lullaby Trust in the United Kingdom and pediatrician Dr. Peter Fleming of Bristol University to conduct the “Oto-Acoustics Signals in SIDS,’ or OASIS study. The two-year study will launch in May. The hypothesis: that an inner-ear defect puts babies at risk of SIDS, since it dulls the impulse for a baby to automatically rouse and reposition itself when it is having trouble breathing. That lack of oxygen, Rubens believes, causes a buildup of carbon dioxide in the body, and the baby suffocates. Partnering with researchers in the U.K. will give Rubens access to data from the standardized hearing test administered to all babies born there. That data will be compared to death records from babies who have been classified as having died from SIDS. “We’re going to see what the difference is between these babies and those who don’t have a SIDS problem,” Rubens said. The United States doesn’t have a standardized hearing test for babies; practices vary state to state. The OASIS study is being funded, in part, by money that poured into Rubens’ SIDS Research Guild after a column I wrote about him last yearreceived international attention. Much of it was from parents who had lost children. He also received support from the Fred H. and Mary S. Dore Charitable Foundation, formed by the well-known political couple who lost a daughter to SIDS. SIDS is the leading cause of death in infants 1 to 12 months old, and about 2,000 babies born in the United States die each year from SIDS, according to the National Center for Health Statistics. “It totally motivates me,” Rubens said, “when you’re talking to a parent on the phone and they tell you what they’re going through, and they really want to help. Rubens, 53, has been researching SIDS since 2007. His work is fueled, in part, by his love for his daughter, Hannah, 17, a student at Ballard High School, and by his work putting babies under anesthesia. “I feel a very strong pull to understand, to really get it, to figure out what is happening to these babies,” he continued, “to do the research and demonstrate that this is correct so we can do something about it. Rubens and Fleming are partnering to review the death records of babies who have been classified as having died of SIDS and compare them with newborn hearing tests of control babies born during the course of the study. Rubens will also partner with Dr. Marta Cohen, a pediatric pathologist at Sheffield Childrens hospital in the U.K., to review CT and MRI imaging of the inner ears of infants who die unexpectedly. And at the Seattle Children’s Research Institute, Rubens will continue his work with Dr. Nino Ramirez to study inner-ear and vestibular system dysfunction in animal models. The goal of the study is to develop a standardized hearing test for infants born in the United States that would identify babies at high risk for SIDS. “This is tricky,” Rubens said of developing a test, “so we need to do it properly and slowly and carefully.